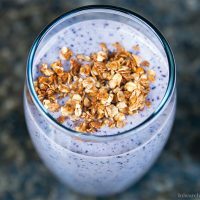 This fresh blueberry smoothie has raw soaked oats blended into it, and crunchy granola on top, making it a delicious and satisfying breakfast or snack! I’ve been really busy over the past few weeks. My freelance work has increased, which is awesome! But more work equals less time, and I’m finding myself eating waaaay to much junk food. So yesterday, in an attempt to get some nourishment and energy, I decided to make myself a blueberry smoothie. I like to make smoothies with leftover fruit that’s in my fridge, like this peach smoothie that uses leftover grilled peaches. I prefer fresh fruit in my cereal and oatmeal (instead of frozen or dried), but they can go bad so quickly (I’m looking at your berries!) that I often find that I need to blitz them into a quick drink before they become inedible. For this drink, I used leftover blueberries, but you could easily make this drink with frozen blueberries too. You may need to adjust the sweetness though, because frozen berries tend to be a bit sour. I wanted to make my drink as substantial as possible, since I’ve been missing meals during the day, so I added some raw oats to my smoothie. I saw my cousin add oats to his protein shake once, so I figured it should work out just fine. I considered just throwing the raw oats in as is, but I didn’t want my blueberry smoothie to be gritty. I ended up soaking the oats in almond milk to soften, then I added them to my blender. I was happy to find that the oats did in fact make the smoothie more filling, and it tasted pretty good too (no grit!). I also added some homemade granola to the top of this smoothie as well. I like the contrast in textures, and it looks pretty too. Of course, if the idea of chewing your smoothie sounds gross to you, you can always leave that out! By the way, I get that not everyone wants to eat just a smoothie for breakfast. I got some flack about that on Instagram, so I’m just clarifying that I’m not suggesting that you should only have a smoothie if that’s not enough food for you. I tend to eat every 3 hours or so, so it’s not a big deal for me to down one of these first thing in the morning and that’s it. For me, it’s better than skipping breakfast all together. But you should do what works for you! Have you tried adding oats to your smoothie before? 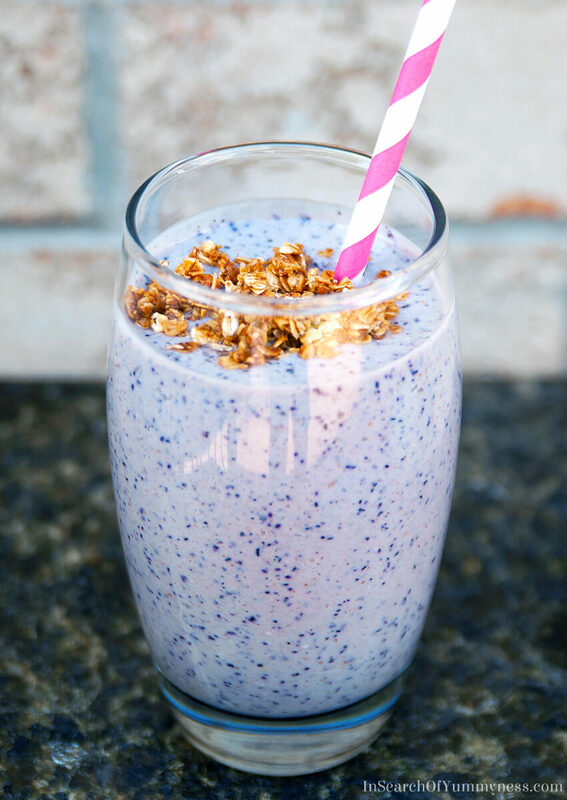 If you try making this blueberry smoothie with oats, let me know in the comments below! Pour the almond milk into a bowl. Add the oats and allow them to soak for 5-10 minutes. Blend until smooth, and top with granola if desired. This smoothie has the best flavour when consumed immediately. It's a good idea to let the oats soak for 5-10 minutes before blending, so that your smoothie doesn't become grainy. Yummo!!!!! I’ll be making this ASAP!! I have never added oats to a smoothie, but I will do it tomorrow morning for sure. I am all about texture and so is my youngest son. This will be a huge hit, thanks! Confession..I am not a smoothie person..probably because I don’t have a blender. I will admit that, this smoothie sounds wonderful. I think the idea of adding some “substance” to a smoothie is a great idea. I am like you, sometimes I forget to eat. Maybe I can ask for a blender for Mother’s Day! Thanks for linking up at Party in Your PJs! This looks amazing!! I’m always trying to find new smoothie recipes to use in my new Vitamix. I can’t wait to try this – pinned! Sounds good! I add protein powder and spinach to my smoothies. I haven’t tried adding spinach… can you taste it? No you can’t, everything else masks it! I add some stevia to it just bc the spinach can take away from the sweetness. This will be my first time to add oats in smoothie because I have never tried it before, but I am sure it will be a superb experience. Thanks for sharing this yummy Blueberry Oatmeal smoothie. This looks good. Nice pictures.